Hello, Kinney Team enthusiasts. I’m Korri, and I’m guest blogging for Kacie this month since the Oklahoma State Fair isn’t her ideal Saturday hot spot. Is the Fair MY cup of tea? Not really. Crowds, tough parking, animal smells, the sun. But fair FOOD is my love language. Deep fried finger food that is so delicious, I completely disregard the inevitable stomach ache. But what better excuse is there to indulge than the fact that the fair only comes around once a year? (Plus, we had tickets to Disney on Ice for my Mickey-obsessed nephew so I was going to be out there anyway). I felt pretty overwhelmed by the food options, so I used the Great Taste of the Fairawards as a guide. I get lemonade every time I go to the fair, but this was the best I’ve had. Typically, the vendors load up on the sugar, but this one was perfectly sweetened. And it was steamy outside so it was a welcome refreshment. Okay. The first bite of this thing was pretty impressive. The fried mac n cheese “bun” was crispy and surprisingly not greasy. But the meat patty was a little…school cafeteria-ish. Once I realized this, I had to stop eating it. The memories, you know? I had a hard time forming an opinion on this one at first. I’m not sure what I was expecting, but I didn’t really taste the Cap’n Crunch (which seems to be the basis of its appeal). So I tried to review it as a standard corn dog, and unfortunately it really missed the mark in that respect. This little pie was super cute, made-to-order, and I recently decided that I REALLY like watermelon so I was excited to dig in. That said, watermelon is relatively flavorless so how was this going to work exactly? Well, as my sister-in-law put it, this was basically a watermelon jolly rancher in pie form. The graham cracker crust is what really made it for me. 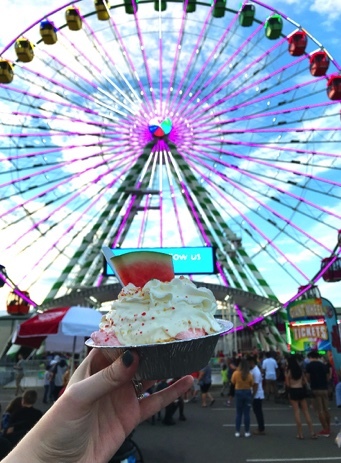 The perfect bite has every element: crust, watermelon cream, sprinkles, a piece of real watermelon, and whipped cream. Gorgeous 4 bed 2.5 bath 2,508 sq ft home in the beautiful Whitehall community. Spacious open floor plan in the living room, crown molding, ceiling fans, floor to ceiling windows and a cozy fireplace. Ample cabinet space in the kitchen with wood flooring, built in stove, recessed lighting and precious white cabinets. Tray ceilings, ceiling fan dual sinks in the master suite. Within walking distance to Lake Hefner. Closing to shopping centers, highways and entertainment. Welcome home!